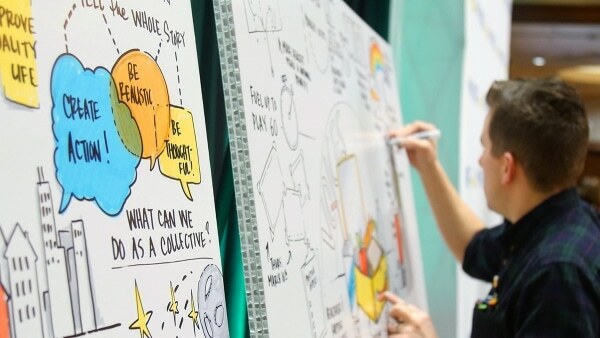 Visual note-taking (also called scribing or graphic recording) is already established as a powerful tool at conferences, meetings, trade shows, and all different kinds of events. These live-drawn notes improve an audience’s understanding of content and help them remember it long after. 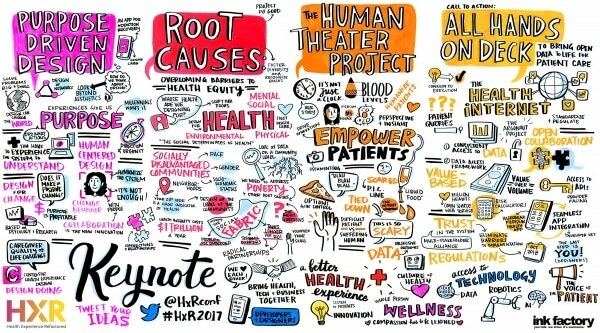 Digital visual notes are being requested more and more by our forward-thinking clients; they’ve used our digital visual notes to support keynotes, panel discussions, and even increase engagement at trade show booths. On top of all the proven benefits visual notes have to offer, digital visual notes have their own distinct benefits. Projecting visual notes on a large scale is the perfect option for events with a larger number of attendees. Large-scale projection ensures everyone will be able to see your content drawn in real-time. Our artist connects their drawing tablet to your AV team’s system. That gives your team the power to put the live visual notes on screen at any time. Show the visuals for the length of the presentation so the audience can see them develop, or show them intermittently throughout a presentation. You’ll have the option to give room to other slides and visual aides the speaker might have already prepared. Visuals are an essential part of any brand’s activity on social media. In fact, tweets with images receive 150% more retweets than tweets without images (source). Sharing visual notes from your event on social is the perfect way to activate your event hashtags in real-time. Digital visual notes provide a fast way to share content with your audience. We can save an image as soon as it’s finished, and upload to your sharing platform such as Dropbox or Google drive. Then you can tweet, ‘gram, or email your audience with digital copies of your visual notes, reminding them of the powerful ideas they just experienced! You can even print visual notes on the spot for attendees to take home. Want to know how digital visual notes (or regular visual notes!) can integrate into your next event? Get in touch and we’ll work with you to create an eye-catching and engaging experience for your audience, employees, clients and more.